recurring (6 years ago) Inappropriate? loulou02 (8 years ago) Inappropriate? Bravo for your excellent work! 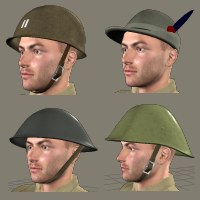 But, Can you create a French helmet (adrian model) model for Michael 3 and M4? I'd love to see an Australian Army slouch hat or a British XIV Army "bush" hat" (they're different!) from you, please. And a NZ "lemonsqueezer" and a US Army "giggle" hat, but thank you anyway for what you have already given us.